Voice Search: What is it & How Does it Affect SEO? Sound familiar? It’s called voice search. “Voice search” refers to your smartphone or desktop computer that has a digital personal assistant or an entry point that uses voice, like Apple’s Siri or Amazon’s Echo, Alexa. Voice search is the fastest growing type of search. According to a Google study, 55% of teens and 41% of adults use voice search on a daily basis. Two years ago word error rate was over 20%, but current speech recognition word error rate is as low as 8%. Voice searches are also faster. Humans can speak at 150 words per minute, versus typing at 40 wpm. This means it’s convenient, instant, hands-free, and increasingly reliable. Voice-based queries are different than written searches because they generally are made up of longer, more conversational phrases. This consists of complete sentences, usually questions. Technology is continually evolving in an effort to understand the intent of the user along with the context of their search. This accounts for voice search is capable of interpreting and responding to what’s been previously searched for, context based on location, app-based context, context of what you see on your screen, context of you and much more. Google has been diminishing the relevance and power of short-tail keywords already due to other factors, but voice search makes short-tail keywords even less relevant. Very few people actually type the way they speak, especially when it comes to search queries. Say you enter something like “weather Kansas City, MO” into your search bar, but when you speak you’re more likely to ask the complete question, “What’s the weather like in Kansas City, Missouri?” This bypasses the need for short-tail keywords and instead rewards sites with content that falls in line with more conversational content or long-tail and more detailed keyword phrases. The websites that are seen adapting to the voice search world are the ones incorporating voice search strategies, like writing content more informally and conversationally. These brands are the ones already ahead of the curve. 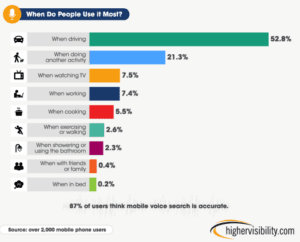 Mobile voice-related searches are 3X more likely to be local-based than text-based queries. So how can businesses ensure they aren’t left behind when it comes to local search? – Verify your Google My Business listing including a long, unique, and correctly-formatted description that includes links to your business. You should also upload high-resolution photos, opening times, a phone number, and a business address. – Use a consistent name, address, and phone number across your online profiles. – Acquire and maintain positive reviews as these have been shown to affect your ranking in local search results. Voice searchers ask questions typically with Who, What, Where, When, Why, and How. They’re looking for quick fixes to their problems. Having a page for FAQs (Frequently Asked Questions) that begins with each of these adverbs and answering them conversationally. More informal answers will have you higher in the voice search rankings. One of the latest evolutions in SEO is a semantic vocabulary code used on websites. This will help return more detailed, informative results for users. For example, if someone searches for “Maroon 5 Tour Dates,” by applying Schema to the SERP, (Search Engine Results Page) you can instruct the results to show tour dates beneath the original search. This helps to promote your own business. Additionally, it gives the searcher what they want, without having to always go the next step to get it. Once you grasp the concept and method of schema markup, you can boost your website in the search engine result pages. 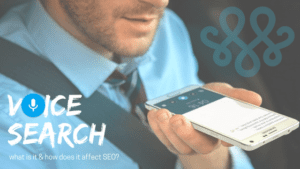 The impact of voice search on SEO is still evolving. But, we do know that optimizing for voice search is very different compared to a traditional search. The main takeaway is that businesses and brands need to learn to incorporate voice search strategy into their websites because voice search optimization is the future of SEO.